900 miles down!!! It feels like my birthday every time we hike another 100 miles. I think it’s a big deal and it doesn’t get old for us. We also hiked .1 short of our longest mileage yet today. We couldn’t have asked for a better big mileage day. It was warm and sunny as we left this morning. If you can believe it, there were still five people at the shelter by the time we left. That must be a record for us! We happened upon a rabbit as we hiked up Hightop Mountain to start the day. We took in the moment atop the mountain as we hit 900 miles and Rabbit (the thru-hiker interestingly enough) was able to snap a photo of us there with a beautiful view of the Shenandoahs in the background. We breezed through the first half of the day and we stopped to take a break near the next hut. The flies were out in hoards today, so we thought we would try the garlic repellent method recommended by 2012 thru-hiker, Sit-a-Bit. We each ate a clove of garlic before hitting the trail again for the rest of our hike. It worked for awhile, but we sweat so much, we must have sweat out all of our natural repellent as well. Maybe we need to up our dosage. It was another beautiful day of hiking in the Shenandoahs. We walked along the narrow path through forests as the long, thin grass brushed against our legs. A cool breeze here and there was a welcome respite from the humidity. We encountered four deer today. All seemed as curious as see were. One deer was in mid-chew of its leafy greens as it checked us out from just off-trail. We had planned on stopping at the Big Meadow Wayside to resupply, but we had packed too much food to begin with coming into the park, so we opted out of the .8 additional round trip mileage we would have added to our already long day. I’m so glad we skipped the store because not ten minutes later did we run into trail magic at the Big Meadows campground just off the trail. A group of four couples from Maryland were camping there for a few days and invited us up for some dinner. We were treated to chili, hot dogs, chips, pickles, veggies and dip, fruit, pound cake, brownies, doughnuts, and beer! It really was perfect timing for us and everything was delicious. We had hiked about 21 miles with 3 more to go. We were getting tired and my feet were starting to hurt. Our hour-long break of eating, talking, and sitting really hit the spot. It was hard for us to leave it all, but we had to finish out our big day. Once we made it to the shelter, we were relieved that we didn’t have to cook dinner now since the bugs were horrible here. No one else was at the shelter, which we weren’t expecting. It’s not often you come across an empty shelter at 8:00 PM on the AT. We got in our tent as quick as possible to dodge the flies. We’re tired, full of delicious homemade food, and ready for a shorter day tomorrow. Since you have to stay at the huts in the park, we would either have to do a 15 mile day tomorrow or a 28 mile day. We chose the former. A short day will not only allow us to take our time tomorrow, but we can also hit up Skyland for breakfast! I’m sure you know this but wearing light-colored clothing discourages mosquitos. Congrats on passing 900 miles! Great photo! You guys are lookin’ mighty fit. Walking 900 miles with 30+ lbs. on your back will do that, huh? Keep on truckin’. See you in about three weeks…. Congrats on 900 miles!! So proud of you guys for doing such long days in the heat and humidity! Be safe & Happy hiking! Great to see you guys are doing so well! 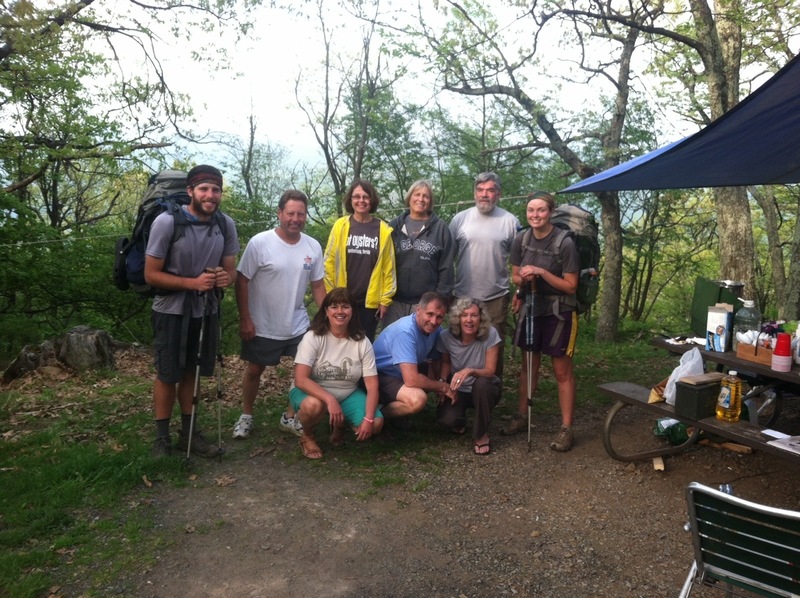 Love reading all of the trail stories and seeing the photos! Thanks for the postcard, by the way! Sending big love and safe travels from Castine! Congratulations on 900 miles! WOW!